The dorsal surface is gray-green in color. A dusky shoulder spot may be followed by several faint spots. Hickory shad have sharp, saw-like scales or "scutes" along the belly. Historically, hickory shad spawned in rivers and tributaries along the Atlantic coast from Florida all the way to the Bay of Fundy, Canada. The hickory shad, a member of the Clupeidae family, is a schooling species. Hickory shad are anadromous fish which spend the majority of their life at sea and only enter freshwater in the spring to spawn. In the Chesapeake Bay, hickory shad spawning runs usually precede American shad runs by beginning in March. Peak spawning time is mid-April through late May, with temperatures ranging from 54-72°F. Peak spawning temperature is 59-66°F. "Repeat" spawning (spawning several times in a lifetime) in hickory shad runs appears to be common, but tends to vary among river systems. In Maryland, repeat spawning hickory shad account for 30-60% of the migrating adults. Spawning hickory shad females (ages 3 to 9) broadcast a large quantity of eggs into the water column which are fertilized by males (ages 2 to 7). Fertilized eggs are carried by river currents and hatch within a few days. Larvae drift with the current until they mature into juveniles. After spawning, adults return to the sea, but their distribution and movements in the ocean are essentially unknown. It is believed that they follow a pattern similar to the coastal migrations of American shad, moving northward after spawning in waters south of and including the mid-Atlantic. A statewide moratorium on the harvest of hickory shad in Maryland waters was implemented in 1980 in order to aid State and coast-wide recovery efforts. 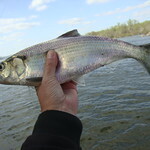 Over the last several years, there has been an increase in hickory shad catches-by both fly and spin fishers in Maryland tributaries, particularly in Deer Creek, the Patuxent River, and in the mainstem Susquehanna River below Conowingo Dam. Because hickory shad do not feed in freshwater during their spawning run, artificial baits such as shad darts, small spoons or wet flies are used. It was once thought that hickory shad were a hybrid between river herring and American shad, but they really are a distinct species. Hickory shad have never been as abundant as other alosine species in the Chesapeake Bay, probably because they are near the northern limits of their spawning range. The Maryland state record hickory shad was captured in the Susquehanna River in 1972 and weighed 4 pounds. In recent studies, the oldest hickory shad in Maryland was nine years old. Maryland stocks between 2 and 10 million juvenile hickory shad per year.